Editorial calendars are hard work for content marketers. Content takes time and effort, which means having a plan for when that content hits the Web is a huge win. A good publishing schedule can help you produce more content than you would otherwise. But a standard editorial calendar can also represent some huge SEO opportunity costs—and an overbearing calendar can lead to a redundant content problem later on. A lot of content marketers focus on what sort of content they should make, but the “when” is also important. How do you put together an editorial content calendar that allows you to plan and produce the content that’s going to be helpful for the market, and also for you? Well, that’s what we’re going to cover right now. 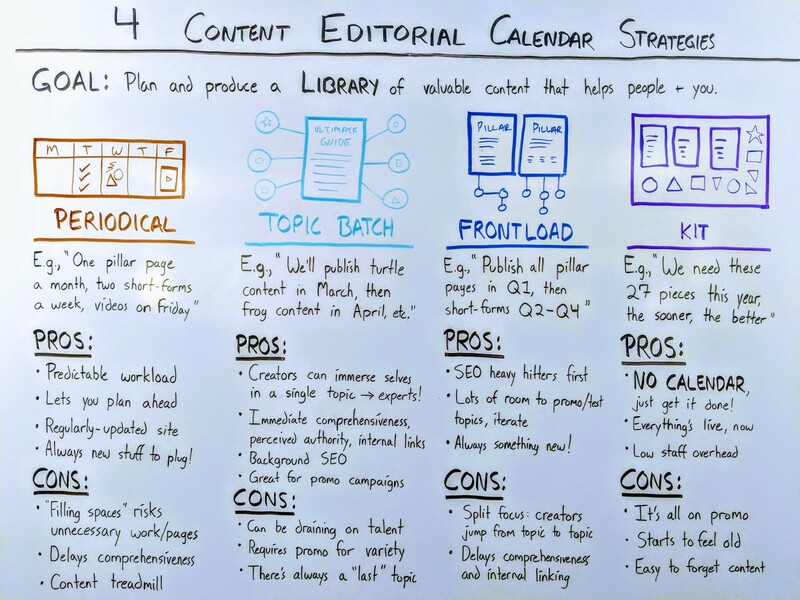 We’ve seen four really strong approaches to content editorial calendars, and we’re going to walk through each of them with some of the pros and cons. First, there’s the periodical approach to content calendars. This is probably the most common type of content calendar out there. In fact, when people think of an editorial calendar, this is what comes to mind. You’ve probably heard people, when they’re talking about planning their content saying, “We’re going to produce one pillar page a month, and then two short-form articles a week, and maybe a video on Friday, and infographics every other Wednesday.” It’s that sort of mindset that produces this approach to content calendars, and there are some pretty good reasons why people use it. Predictable workload. For one, we’re all producing content on some sort of timeline, so it makes sense that we would just say, “Well, here’s the calendar. 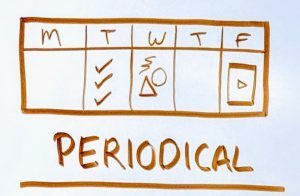 Let’s see how we’re going to systematically approach every given month.” We come away with a predictable workload when we use the periodical approach. We know that it’s going to be a certain amount of blog posts every month, a certain amount of e-books and all of that good stuff, and that makes it really good for content teams, because you get to know generally how many hours are going to be spent on producing content. How many ad campaigns are we going to run? If you’re putting together different ad campaigns, when can that team expect new content to go live? And, of course, it works really well for vendors because you can get someone on retainer and say, “Hey, we need six blog posts a month,” and you’re good to go. So, it’s really beneficial for a lot of people when they’re planning to use this approach. Regular updates. Plus, you have a regularly updated site. Search engines see that you’re consistently uploading new content to your site. Visitors see that you’re consistently doing that. Always something new to promote. You just always have something new to plug on your blog, and that’s really good not only from a content production standpoint but also from a content promotion standpoint. If you’re handing off content to an ad team, or a link-building team, or a customer lifecycle team, then they always know there’s something new and valuable coming down the pike. There’s a good reason why this is so popular, but it comes with some cons that we need to consider. Unnecessary content production. One con is the problem of filling spaces. For example, if we said, “Well, we’re gonna do one pillar page a month, and then four short-form blog posts every month,” that is good … until maybe we run out of topics to write pillar pages about. It’s possible that your business doesn’t need to have 12 new pillar pages going live every single year, or they don’t need to be married to some sort of cadence or schedule like this. By giving ourselves spaces to fill in, we might be signing ourselves up for a lot of unnecessary content and work. This is how a lot of blogs get redundant content. NOTE: If you’ve been using this approach to content calendars for more than two years, you may want to check out our videos on the dangers of redundant content and how to fix it. Delayed comprehensiveness. A lot of companies also run into the problem of delaying comprehensiveness. They’ll get into some sort of flow where they say, “We’re going to publish a blog post about this category on the first week of the month, and then this category on the second, third.” A problem with that is that although that gives you a nice predictable pattern, it also means that if you’re only publishing one post a month on a certain category, it’s going to take you a while for those posts to accumulate, and so you’re delaying any sense of comprehensiveness that you’re giving to your readers, and you’re also delaying any of those internal links that you could be building, and that’s something that you need to consider if you’re going to go all-in on this model. The content treadmill. A third con is it puts you on a content treadmill. If you’re obligated to publish a certain type of post a certain amount of times a month, or a quarter, or a year, then you might lose focus of what the content is actually there for. It sounds really silly when you’re putting together the plan, but this really does happen. It is a danger content marketers face: thinking of success as a measure of how much content you’ve published, as opposed to what that content has accomplished for you. So, if you’re going to take this approach, watch out for that. That can be dangerous. You just take on the entire topic, do it all in one fell swoop, and then you’re good. You can move on to another topic. Let’s look at some of the pros and cons of that. Creators develop expertise. Creators get to immerse themselves in one topic at a time. They get to focus on writing that long-form pillar page (or however many pillar pages you need). They get to do some short form pieces. They might be able to do infographics. They might be able to do e-books (whatever your content strategy calls for—you get it). Those creators get to become experts on those topics because they just get to dive in and focus on that. Comprehensiveness up front. When people find your site, they see 10, 20, 40 articles—however many were in that batch. It shows them that you have plenty to say, that you’re thought leaders. SEO up front. It’s really good for users, and it’s also really good for the search engine robots, because they see all of those internal links pointing to your pillar pages. It just shows search engines that you know what you’re talking about and you have a lot to say on a given topic, which is really good. You get to run that SEO in the background, so you publish a batch of content on a topic, and then you move onto the next one. Obviously you’re going to want to put some promotion behind that batch of content, but you get to start putting all of that content to work for you in the search engines, which is really great. Great for campaigns. When you’re working with your promotions team, this strategy helps you build educational campaigns—because you have all the content on that topic ready to go. So, that’s really helpful. Internal topic fatigue. Well, there are a few. One is that it can be kind of draining on the talent, so whereas you have the upside of talent becoming experts in this material, they can get tired of writing about the same stuff over and over again. That’s something that you’ll want to watch out for if you’re taking care of your internal team. Requires a plan to keep content in circulation. If you’re publishing content in topical batches, you’ll need to plan ways to distribute that content over time. (Otherwise you’ll publish all of your content on a certain topic during a two-month period of the year, and then never promote it again.) So, your promotions team’s going to need to work on building some email automation, retargeting campaigns, all of that evergreen activity to make sure that once this topic goes live, it’s still getting promoted after you’ve moved on to another topic. 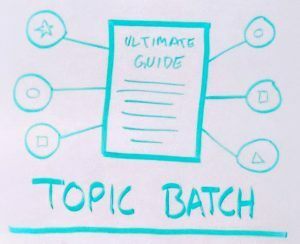 This is similar to the Topic Batch approach, where you’re publishing everything on a certain topic, except you’re taking all of those topics and then just publishing the most important, vital pieces on those topics first. NOTE: If you’re curious what kind of content should get frontloaded in our strategy, check out this section in our Beginner’s Guide to B2B SEO. SEO up front. One is that you get all of your SEO heavy hitters live right up front. They start gaining some of that SEO traction in the background for you while you’re creating more content. So, that’s really good. Testing and validation. You also have lots of room to promote and test those topics. So create your large, most important vital pieces, and then promote them. Run ads to see which topics gain the most traction with your audience, and then create supporting content according to demand. You can make some adjustments to your strategy when you already have the most important content made, so that can be really helpful. It also gives you plenty of time to iterate on your content because you’ll have people asking questions in the comments. You’ll have people replying to emails, and that can give you ideas for more short-form content later if the vital foundational pieces are already done. Always something new. 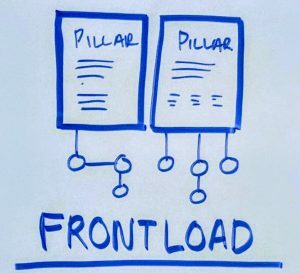 Similar to the periodical approach, frontloading keeps you stocked with something new to say because you’ll be working on that short form and supplementary content for a while afterward. Diffused focus. Now, on the con side, you have the opposite of the strength of topic batching. Rather than throwing your creative team into one topic at a time to develop expertise, they have to split their focus to create in-depth content about different topics. So, their attention is divided as they write the most authoritative pieces. That’s a risk that you’re going to run into when you’re dealing with any sort of internal creative team here. It can be kind of tiring on them, and it can take a toll on the quality of your content, so watch out for that. Delayed comprehensiveness. It also does delay some of that comprehensiveness. While you get the big important pieces of content published, you’re still going to be trickling out the supplementary content, and so that’s something that you’ll want to watch out for. That’s just an inherent weakness of this strategy versus the topic batch. No calendar, just go! Some pros to this are you don’t have a calendar to worry about. It’s just a list of pieces that you need to write. You get it done, you move on. Low staff overhead. It’s really great for when you’re organizing your staff because now you don’t necessarily need to hire full-time writers. You can contract some experts, have them create the content that you need, and then move on. Everything’s live, pronto. You’re not waiting on links to develop. You’re not waiting for any of that comprehensiveness to spool out over the coming months. You just know what you need and you publish it. Requires promotional rollout. Some cons that come with this practice is it is entirely on your promotions team to make anything happen with this content. You’re going to get some organic traction, but you are going to need to tell your email list about it—and probably not all at once. You’re going to need to work this into any sort of campaigns that you’re putting together. You’re going to need to put together your marketing automation, your email, your advertising. All that stuff falls on your promotion team, and they don’t have anything like a publishing calendar to rely on. They need to do it all themselves, so that’s something that you should be aware of if you go in on this approach. Content can feel old. It’s kind of hard to admit, but it’s easier to promote content that we feel is new and exciting. If your internal team is excited about new content, then it’s easier for them to promote it. It’s easier for them to write copy about it. But if you publish all your content at once, then you are going to run into this problem of starting to feel like your content is old and you’re not as enthusiastic about it, so you’ll want to watch out for that. Plus, it’s easy to forget about content that you’ve published if you did it a long time ago. 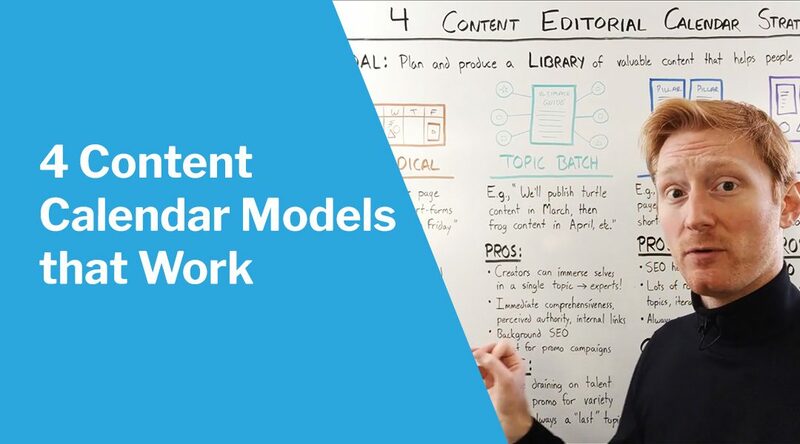 This is a case in which the Kit model and the Periodical model can pose the same risk: you could be in two opposite models, but still find yourself creating redundant content because you forgot that you already published something similar as part of a kit. 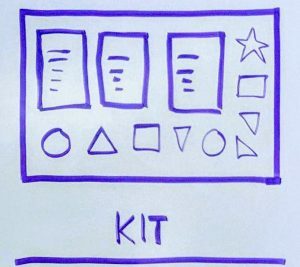 So you’re going to want to make sure that you keep inventory of your content if you’re publishing it under the kit model so that you don’t end up duplicating your efforts later. You’re probably picking up on the fact that these aren’t entirely mutually exclusive. You can mix and match, and kind of blur the lines between some of these. But generally speaking, if you keep these four approaches in mind, then you’ll have a good way of planning the content that you need, and also planning how you’re going to make it in a way that sets you up for longterm success and engagement with your customers.